Ibrahim Ansari cuts zucchini at Horizon Montessori Public School’s garden Monday, May 7, 2018, in Mercedes. 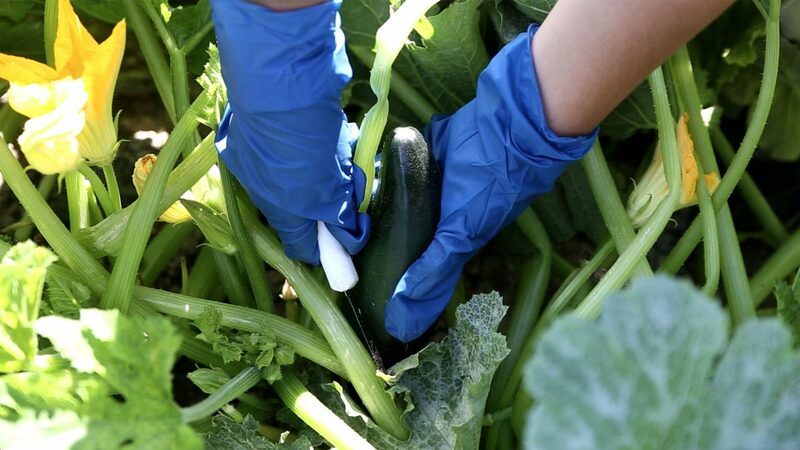 Fourth-graders wade through rows of zucchini, leaves rising above their knees. They comb through vegetation, searching for squash large enough to pick. Located yards off Expressway 83 in Mercedes, the land behind a warehouse was cleared of brush beginning last summer. About an acre of vegetables — about 20 varieties, including kale, beans, cauliflower, radishes, corn, and four types of tomatoes — are in the ground at various stages. Horizon Montessori Public School in Weslaco enlists third- to eighth-graders to plant, harvest and maintain this garden. Veggies end up in the school’s cafeteria. Principal Janis Montemayor said school students often eat their meals on campus not knowing where the food comes from. She credited the district’s superintendent Alim Ansari for prioritizing students’ awareness and involvement with their environment. Students used small knives to trim large kale leaves, working together to fill boxes. Later, they’d yank radishes from under the soil, carefully discarding those cracked by uneven watering. Fourth-grader Emery Castro, 10, said she used to wonder where food came from. Downing said future plans include applying for grants to lengthen the growing season by acquiring a greenhouse, possibly building a chicken coop and expanding the crop yield by farming an additional acre. The program will also include kinder students in the upcoming weeks. “We’re trying to look at different ways to educate the children out here,” Downing said. Staff emphasizes that society is digitally dependent, and providing students the chance to connect with the Earth is grounding. Montemayor said that as a principal, it’s rewarding to see students produce something with their hands and it offers lessons that can’t be taught in the traditional classroom. “To see our students are literally working … to bring something to life … is not something a lot of people can say they’ve done,” she said. “To me, that’s a huge part of being a well-rounded individual.